The GT-906A15 from PlanetechUSA.com was built to be stable and dependable. 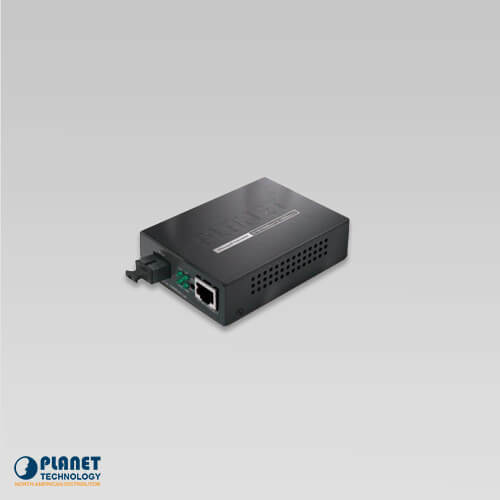 The GT-906A15 provides efficient management with SNMP interface and remote web management. This series was built to be a simple and easy to use management system and configuration unit. The GT-906A15 has the ability to support SNMP and can be managed by any management software that is standard based. The GT-906A15 has the ability to contour the TS-1000/802.3ah OAM protocol remote device–this allows management to be truly simple. The unit has the ability to be utilized for enhanced management, such as the DHCP Client function, configuration of IP addresses, converter configuration, Q-in-Q VLAN, bandwidth control for Ingress/Egress, QoS and Layer protocol filter, bandwidth control and utilization, or broadcast storm. The GT-906A15 has the ability to operate efficiently with technologies such as IEEE 802.3 10Base-T, IEEE 802.3u 100Base-TX, IEEE 802.3ab 1000Base-T and IEEE 802.3z 1000Base-LX / SX standards. This unit can also be operated with the PlanetechUSA Media Converter Chassis, models MC-700, MC-1000 and MC-1500.